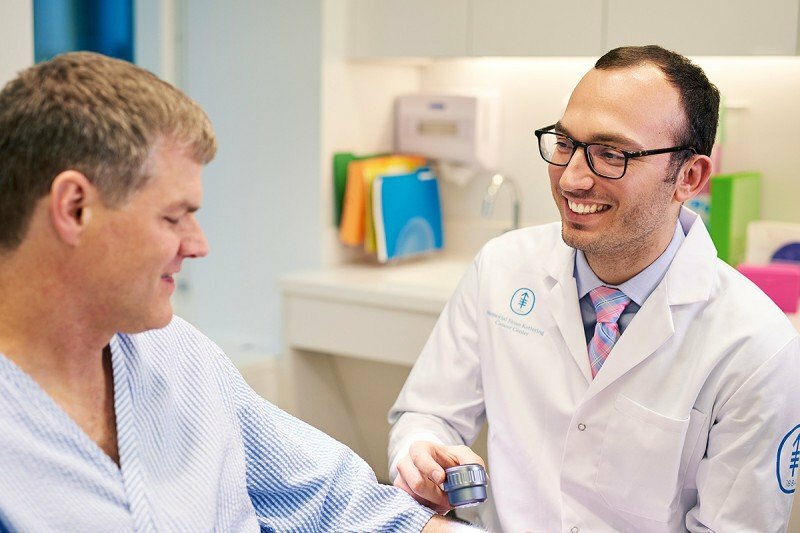 Dermatologist Michael Marchetti speaks with a patient about treatment options for melanoma. Doctors are constantly helping their patients deal with sensitive issues and passing on — and receiving — information. Demonstrating traits like empathy, sensitivity, and discretion can improve communication between doctors and patients. Memorial Sloan Kettering’s Comskil program is designed to teach doctors how to better use these skills. Doctors help patients deal with difficult issues. Better communication can improve doctor-patient relationships. MSK’s Comskil program teaches these techniques. The doctor-patient relationship can be fraught with sensitive issues. For doctors, delivering bad news (or even good news) delicately, discussing treatment options, even handling anger or sadness can define whether communication is successful, and whether the dynamic is a positive one. A recent segment on the Brian Lehrer Show that dealt with this topic featured Philip Bialer, Interim Director of Memorial Sloan Kettering’s Communication Skills Research and Training program, or Comskil, an innovative program that’s been teaching doctors how to improve communication with their patients since 2005. About 100 fellows and residents at MSK are required to participate in a Comskil course every year as part of their oncology training. Subjects covered include how to break bad news; discuss prognoses and treatment options; respond to patients’ anger; help the transition to palliative care; and handle end-of-life care, death, and dying. We devised this course to make us … better understand our patients' needs. To evaluate its effectiveness when the program first began, Comskil staff would record an in-person meeting between physician-trainees and first-time patients who agreed in advance to participate. Today, doctors interact with actors playing patients, so they can by evaluated on the complete spectrum of skills. Before each scenario, facilitators give the actors instructions — for example, asking them to weep or to react with anger, or to show any of the range of emotions a patient might experience. At the conclusion of a scenario, doctors are able to view a video to see exactly what they were doing and learn where they can make improvements. Doctors also receive feedback from the facilitators, and even from the actors, who often remain in character to deliver their assessments. One of the first physicians to take the course was medical oncologist Maura Dickler, a breast cancer specialist. I'm always checking in with [patients], taking stock of what they heard. There is good and bad in every business, however you do not expect the professional staff, for the most part, to make discriminatory comments. A highly sought after surgeon demonstrated poor "bedside" manners in a very shocking way by mocking Hispanic culture and language. Sorry to see this happen in today's day and age, from a surgeon who himself is Asian. Not going back and I severely recommend not choosing this hospital, the perception here was arrogance in abundance. Sad. We are very sorry that you or one of your loved ones had this experience. Our Patient Representatives are committed to ensuring that your rights are respected and that your concerns are addressed. We have sent them your concern, and you can contact them directly at 212-639-7202 to discuss this in more detail. Thank you for your comment. I believe it is equally important to train a doctor's staff and nurses to be sensitive and compassionate with patients who have the most dreaded diagnosis - cancer. Most people at MSKCC are kind and supportive. However, I have had a few experiences with "nasty bullies", not MDs. Barbara, we are sorry if you had a bad experience with some of our staff. Our Patient Representatives are committed to ensuring that your rights are respected and that your concerns are addressed. We have sent them your concern, and you can contact them directly at 212-639-7202 to discuss this in more detail. is there a comskil program for nurses ? Thanks for your question. Yes, MSK nurses do train with Comskil. You can read about the experience our our pediatric nurses here: https://www.mskcc.org/blog/david-s-legacy-communications-pediatric-nurs…. The program does host events open to the public. If you’d like to find out about any upcoming programs, please email comskil@mskcc.org. Thanks again for your interest! Hi Rebeca, we’re so pleased to hear that you found your Comskil training valuable. Thank you for your comment. I'm a working actress and a fellow actor told me that your Comskil program employs actors in their training program. .Can you tell me how to apply? Dear Sheri, if you interested in applying to work in the Comskil program, you can contact Comskil Manager Shira Hichenberg at hichenbs@mskcc.org. Please be sure to include your head shot and acting resume. You can contact Shira at 646-888-0212 for more information. Thank you for your interest in MSK.